THE INDISPENSABLE GIFT OF THE HOLY SPIRIT (May 11, 2016) | Connecting with You! Dr Jim McClure, noted theologian, highlights the primary purpose of Pentecost. The first Christian Pentecost that took place 50 days after the resurrection of Jesus Christ was a pivotal event in the life of the church. It celebrates the outpouring of the Holy Spirit on the church to enable it to accomplish the mission given to it by Jesus. Yet Christians have often either failed to recognise its essential importance or have swung to the other extreme by misinterpreting and overemphasising its significance. Let’s consider the biblical basis of the importance of Pentecost for the church today. Pentecost had always been part of God’s plan for the world. It was not intended to be a surplus add-on event to the Christian faith to make it more exciting! From the beginning it was central to God’s grand plan for world redemption. Although we may think that Pentecost is a uniquely Christian celebration, it actually has its roots in the Old Testament. The word ‘Pentecost’ is a Greek word that means ‘50’ and Christians borrowed it from Greek speaking Jews who used the word to refer to a Jewish festival called ‘shavuath’ which in Hebrew means ‘weeks.’ So how are the two words related? We read in Leviticus 23:16 that the Israelites were instructed to celebrate the harvest festival seven weeks (50 days) after Passover. And in Exodus 23:16 God told the people, ‘celebrate the feast of harvest with the firstfruits of the crops you sow in your fields.’ Note this – the Feast of Weeks is also called the Feast of Harvest in the Bible. Pentecost is also associated with a promise God gave through the prophet Joel, ‘I will pour out my Spirit on all people’ (Joel 2:28). When Peter preached the first Christian sermon on the day of Pentecost to the crowds in Jerusalem, he quoted this specific verse, adding, ‘This is what was spoken by the prophet Joel’ (Acts 2:16). Peter was referring to the event that had just occurred as a group of 120 followers of Jesus were worshipping in a house. ‘Suddenly a sound like the blowing of a violent wind came from heaven and filled the whole house where they were sitting. They saw what seemed to be tongues of fire that separated and came to rest on each of them. All of them were filled with the Holy Spirit and began to speak in other tongues as the Spirit enabled them’ (Act 2:2-4). On that day God poured out his Spirit on the church. This was for the whole church – not just a special blessing for a few privileged Christians. This was the promise of Pentecost! We find the clue to the purpose that lay behind the promise in what Jesus told his disciples just 10 days earlier. He said to them, ‘You will receive power (dunamis) when the Holy Spirit comes on you, and you will be my witnesses in Jerusalem and in Judea and Samaria and to the ends of the earth’ (Acts 1:8). The purpose in empowering the church that was demonstrated by prophetic declaration, supernatural signs and by the events that followed emphasise the importance of Pentecost. I wrote earlier that another name given to this celebration by the Israelites was the ‘Feast of Harvest.’ On the day of Pentecost the harvest began! When Peter preached ‘about 3000 people were added to their number that day’ (Acts 2:41). The Holy Spirit was not given to the church for our entertainment or our titillation, or to bring some excitement into our otherwise dull Christian lives! Pentecost’s primary purpose is harvest – the harvest, the in-gathering, of the souls of ransomed, healed, forgiven men and women. The Holy Spirit was given to the church to empower it, energise it and enable it to do the work of evangelism and disciple-making which was – and still is – God’s purpose for the church. On the day of Pentecost the kingdom ministry of Jesus was transferred to the church. The work of the kingdom of God is our ministry in the world. When we lose sight of that, we lose sight of our raison d’être, our purpose, as the church. Jesus didn’t release his church to proclaim his kingdom message until he had empowered it by the Spirit. The primary resource for the church from the 1st century until now is the Holy Spirit. All local churches have their organisations, the programmes, their plans, their bright ideas, and so on – and there is nothing wrong with that – but none of these things are adequate alternatives to the power of the Holy Spirit. We may have the latest TV with incredible specification, functions and picture quality, but it will never function and we only ever see a blank screen until we plug it into the power socket! In the same way the church will never adequately function apart from its Holy Spirit power source. How desperately in need is today’s world for the good news of the kingdom of God. The world is in a terrible condition today. Daily we are confronted by news of unfathomable violence, hatred, destruction and greed. Sound values that we once thought were unchallengeable are being disposed of as being past their ‘use-by date.’ Good is often considered to be evil and evil is called good. Daily societies worldwide are turning viciously against all things Christian. We wonder what we can do in such a God-rejecting environment. And the answer is that we can do absolutely nothing – unless we grasp the message of Pentecost. Apart from the Holy Spirit the average Christian is stuck in an average Christianity that is powerless to the point of irrelevance! A W Tozer made the following comment about 60 years ago and it is still true for today: ‘If the Holy Spirit was withdrawn from the church today, 95% of what we do would go on and no one would ever know the difference.’ But if the Holy Spirit had been withdrawn from the early church, it would have ground to a halt and everyone would have known the difference! The 1st century church was born into a world that in many ways was similar to ours today. It encountered a world of rampant moral decay, social confusion, political violence and corruption, religious pluralism. It was a world that was so opposed to Christianity that it slaughtered many thousands of men and women who professed their faith in Jesus Christ. Yet that church not only survived that hostile environment, but grew and became strong as its message of divine love and forgiveness swept through the world and changed not only individuals but also nations. What was the early church’s secret? ? It didn’t have a secret! It was the power of the Holy Spirit, active in ordinary men and women who depended on him and depended on his power to be a reality in their lives and who allowed that power to be active in and through them. They were committed to honouring, obeying and serving God, not in their own strength, but in the strength he made available through the Holy Spirit. To the early Christians, the person and work of the Holy Spirit was not just a doctrine to be argued about and fought over, but the One through whom the unquenchable, unfailing power of God was poured out on the church on the first Christian Pentecost. And he is still needed by every Christian and every church if we seriously want to serve God his way and with his provision. 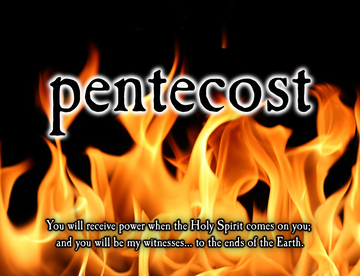 This is the challenge of Pentecost! May the holy fire of Pentecost burn again and that rushing wind sweep through our midst like a mighty hurricane of Holy Spirit power.